We have the most wonderful customers - thanks to all of you. There is nothing that warms our hearts more than hearing these stories and we appreciate you taking the time to send them to us. I looked into getting a sugar glider and finally settled on SunCoast because they showed the pros and cons of this adorable pet. Lisa spent time on the phone and emailing with me and, although I eventually decided a sugar glider was not right for me personally, I can attest to the fact that Lisa was considerate and supportive in helping me come to that hard decision... Also, I have made a real lifelong friend, and we still e-mail all the time.... She is a truly kind person and animal lover and their critters are so darn cute, chock full of southern charm! Viva La SunCoast! This is Page 1 of Customer Comments. We purchased the new Cage & Toy Wash a couple months ago and we love it! I think it does a much better job of getting the cages clean than what we were using before. And I love that it’s made with natural ingredients and is safe for the environment (along with being safe for our little ones!) Anyway, just wanted to let you know what we thought of it. Thanks for all the great products! I love your products and your company, and trust me when I say I have tried them all, I always come back to you..how can we comsumers not continue our patronage towards your company. We are the ones who should be thanking you for the 8 wonderful years you have been providing us with the updates and quality products. Thank you and do continue to provide us with more toys and items for our beloved joeys. Hi there!! I ordered the Sturdy Glider Cage about a month ago, I'm not sure if you'd remember, I had it shipped to an FPO over here in Okinawa Japan. Well, let me tell you, the cage arrived the other day and we couldn't be happier!! First of all, it was really easy to put together, which made me happy since I'm the clumsiest, most mechanically UNinclined person you'd ever wish to not meet lol. In 20 minutes I had it assembled, no joke. Secondly, it's HUGE. Like GINORMOUS, almost too big for my tiny, Japanese apartment. SO MUCH CAGE for the money, even with the shipping. I had found cages here comparable, but the bar spacing was inappropriate for a suggie, and for me to have bought one of those cages, it would have been more than your cage plus the shipping. Since the move, which was only two days ago, Elliot is a completely different glider. I had him in a much smaller cage, which was the biggest one I could find with the right bar spacing here, and he's so much more active and interactive. Of course he got all new stuff for his new home, but that's neither here nor there. He LOVES the new house, and so do I. Thank you guys SO MUCH for shipping to me here. I was having a really difficult time getting anything shipped. I may have paid for it, but you really came through and made my wee man very happy!! SO WORTH the shipping cost. I plugged you guys huge on GC. Thanks for your response. I actually ordered a few things last week and received my order the very next day. I will continue to order from your wonderful website and looking into buying another sugar glider from you soon ;). I just wanted to send in some feedback for the Wholesome Balance Chicken and Brown Rice Blend. My little picky eater just LOVES it! His previous owners were nice people, but purchased him for the cute factor, and quickly lost interest in the intensive care process. I had a crash course in glider care and have been absorbing as much from your websites and other sources as I can. He's still super picky about his food, so i can't tell you how relieved I was when he dug right into the staple food I ordered from you guys. He'd never been bonded to anyone, so I carry him around with me all day in a bonding pouch and bribe him to come to me with treats. He just loves the papaya treats you sent with my order! I'm certainly purchasing some of those next time I place an order for more of the Chicken and Rice blend. Today, he actually came out of the pouch and hung out on my shoulder while he ate the papaya. It's really helping the bonding process, as he seems to be highly food motivated. Thanks so much for giving us these great resources! I will certainly be purchasing from you again! I just received my order and wanna thank for the 2 extra gifts. Rocky loves the Papaya and has a blast with the ring thing. Thanks again you have earned my business. I'm originally from California but live in Thailand now- my aunt is coming to visit from Cali and I'm asking her to bring me over some supplies for my new baby suggies that I rescued from what I've coined as "Sugar Hell" out here. The full story is here if you're interested. Anyway, I just wanted to thank you guys for having such good products that I know I can rely on. Living out here keeps me pretty cut off from easy ordering and the option of returning if something is amiss, so it puts my mind at ease knowing I can order from good people who I trust to sell quality products! i just had to send you a quick note about how AWESOME you guys are. i have never had such great, fast service as to when i make an order with you. i have done several orders in the past 6 months and your follow up time is the BEST. not to mention that you have the best products for my suggies and the best information as well. thank you so, so much for what you do. We have over 16 gliders in our care alongside hedgehogs and have found your ZooKeeper's Secret staple diet to be the #1 favorite among all our small mammals. We have tried just about every available glider / hedgehog diet on the market and found that our animals actually prefer ZooKeeper's Secret hands down to any other choice of staple food. They have been on this diet now for a little over a year and won't touch anything less. This truly is the #1 choice of the animals. I just wanted to thank everyone at SSG. Four years ago I got a male and female from you. Needless to say, many babies later (about 20), all have been healthy, no need for a vet or any deaths or illness. But more importantly, my students have learned SO much and have truly enjoyed the little colony we have. I teach Vet Assisting for high school juniors and seniors. We have a lot of animals so they can learn animal handling skills. The animals are divided into 12 groups and the students spend a month caring for each group. They really love the gliders and they are such a good example of captive wildlife care and marsupial reproduction. Even my volunteer got excited and eventually built large cages by using four screen doors together to make a cage. I have also been able to give extra gliders to other school programs so more students could learn about these little guys. I just wanted to say thank you for this newsletter issue. I have a glider named Baby who I've had for about 3 or 4 months. No matter how much I hold her or rub her pouch she was still crabbing and nipping at me. I was truly getting frustrated because my other glider, Otis bonded almost right away with me. We received our order today. Chimpy, our glider, loves the food & the toy. I was surprised by how fast he devoured the food... he REALLY loves it. We look forward to ordering more merchandise from your office. Have a great week! You don't know what a great service you provide for new sugar parents. I can remember 2 years ago how intimidated I was of those 2 little stinkers after I picked them up from the airport. I can remember not being able to put my hand in there pouch without getting bit with a ferocious crabbing on the side. It was you who told me to keep trying and not let the brats have there way. Now 2 years later I very seldom hear a crab or get bit. They even let me rub there tummies now and i can whip up a batch of leadbeaters mix with my eyes closed. I can not deny that the relationship me and the babies have is due to your advice in the early days. I would just like to let you know what I think of you cage that I ordered Last week. I have seen a lot of cages in my time and own some as I have a number of small pets but I have never seen a cage like yours. Easy to put together and sturdy, and nice looking. I am so glad I found your web site and you are so near. I adopted a one year old female sugar glider last week from a local family and she is the sweetest little thing. She was in a small cage (large bird cage) . Once we put her in your cage she became a different little girl. She is having so much fun in her larger cage and loves her new wheel. Thank you. service, and the great products you sell. I feel as if I'm doing business with someone who cares about me and my little animals and less about the bottom line. who is going to raise a sugar glider to order a starter kit. The deals are very economical, complete, giving you the confidence you need to start out worry free. Again thanks for the personal touch. I would recommend Sun Coast to any Sugar Glider owner. I found your website while trying to become more educated about sugar gliders. I have to say, your site is the best I have found. I am impressed and thankful for the information on many different levels. I am one of those people who made an impulse un-educated purchase of sugar gliders. I purchased a male (Grumpy) and female (Bouncy) at a Sportsmen’s Expo. I think the goal of the vendor was more to sell than to educate, many impulse buyers. The diet info on your site was much better than the info I was given. I decided to try some of the Zookeepers Secret. My sugars were eating a dry pellet called Glider Grub. I tried to transition the ZKS slowly but as soon as I started feeding them this new food, they went crazy for it and often want to eat this first! I am very glad that I gave this food a try. Thanks!!! Thank you so much. I so love everything I get from you for all my sugar babies. You will have me as a lifelong customer! I just wanted you to know how much I love your site and your store! I got my big shipment today, and I don't think I've ever seen my baby Toolah more excited! She loves those grasshoppers, they're HUGE! And so crunchy, you know they must be full of calcium. Her sturdy cage is totally decked out now, and the first thing she did when I gave her the grasshopper was run and hide in her new log to eat it. Toolah and I meet a lot of people, and everyone wants to know where they can get a sugar glider, or where they can get more information. I always give them your website. I was helping a friend at a pet expo a few weeks ago and Toolah made quite a few friends, I must have given your site out to at least 30 people because I went through a whole pad of paper! Honestly, I give it out so much I should almost get cards of yours to hand out. You have the best information on the whole web on gliders, and the best attitude about responsible ownership. I feel confident when I send people to your site that these precious creatures won't end up in the wrong hands, and that they know what they are getting into. The cage came in wed as tracking said. I told Rosi (my fiance) to just put it aside and I would put it together when I got home. I got a message a few hours later that she had already assembled it ! I was impressed! (she put all the cups in and rope toys, sleeping pouches. all set up). A concern of mine (knowing that gliders are nocturnal -e ven though we don't go to sleep till about 4am) was the sound that a flimsy bird cage makes with the slightest touch, that clang of wire on wire..when you said sturdy cage, you meant STURDY cage. This thing is very high quality. I admit I shook it a good bit and jostled it around and almost nothing! Thank you for recommending it to us and carrying such a high quality product. It seems that no one takes pride in their products anymore and to receive something that I find to be an impressive item is unusual! I know you didn't manufacture it yourself but I am thankful that you carry them and speak highly of them. Just wanted to say thanks a bunch for this great order!! My gliders LOVE their new cage and spend HOURS on the wodent wheel. I couldn't have found this great stuff anywhere else for such a good deal, and just wanted to let you know how happy I am. I will definitely recommend you to my other gliders keeping friends!!!!!!! I wanted to let you know that our little ones are enjoying the Wodent Wheel and the Nail-O-Matic! They both ran so much that they later curled up in the bottom of the wheel and took a nap. I tried the Clean+Green Odor Neutralizer and it works great. I need to clean the cage and am waiting for the Scooter's Choice to get here to clean the cage and tried the Clean+Green Odor Neutralizer to see if it would cover the odor and it actually made it go away. It did not seem to bother either Elvis or Priscilla as they later roamed the cage. I have not seen them climbing the rope toy yet but it has been moved so I know they have checked it out! They seem to be taking to the ZooKeepers Secret food and they love the papaya treats so I know the little bag I got will not last long. I see more purchases in the future but am starting to look at the cages first and will probably upgrade to a larger cage once I figure out where I will be able to put it. I just wanted to thank you for the prompt delivery of the nectar I recently purchased. I have to tell you about my experience with another company. I purchased a bonding pouch and sleeping pouch as well as a hammock for my little girl I just adopted. I tried to order every thing that would make her comfortable. This company, XXXXXX.com, took my money and never shipped out my purchase nor have they responded to any of my email. Needless to say, my Zoë has gone without her very much needed cage material. I am going to purchase from your company the bonding pouch / sleeping pouch in Mod Flower pattern. I look forward to doing business with you again very soon and thank you for making my purchase perfect. I just got my supplies yesterday. Everything arrived and was in great condition! And thank you for packing the papaya treats and "the finger thing". I'm sure they will be very appreciated! Anyways, just wanted to thank you for doing a great job and always being there for help. Look forward to ordering from you again. I ordered a cage from you guys last week. Not only did it come so fast I wasn’t expecting it, it was SOOOO cheap. I had received my tax money and decided the boys needed a new cage. I'm going to be honest I was afraid it would be too small. But, yesterday evening when I got home and saw the box on my porch I was literally freaking. I immediately put it together and put the boys in there. THEY WERE SOOO EXCITED. They were barking and jumping from their ropes and running around and it was amazing. THANK YOU SO MUCH for making such a wonderful thing available for my little boys and I. Now, we just have to find somewhere to put them haha. Hey Lisa, it's Sarah Frary. 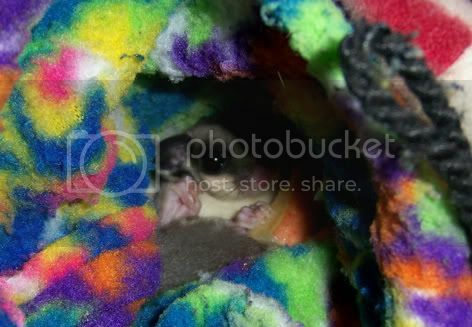 I had adopted a sugar glider baby from you some months ago, in December. I just wanted to throw an e-mail at you to let you know how my little girl is doing. I received my Sturdy Cage today! My girls absolutely love it! It is so much bigger then the one that were previously living in. My loveable Chiana quickly discovered the wheel, and quickly did a face plant as she didn't understand what was going on, why it was moving. She quickly got the hang of it, even though her bossy sister Aeryn was attempting to play on the outside of the wheel. Once in it together they tried to run in different directions and guess what? Yeah it didn't work. They spent 20 minutes running around that cage investigating ever little inch of it before they got tired and discovered their new sleeping pouch. They fell asleep together and it was just too cute. I want to thank you again for the good price on the cage and everything that came with it. They so love it all. Thanks a ton. I just wanted to take the time to say "THANK YOU!!" I absolutely love the cage. It was interesting putting it together by myself (an extra pair of hands would have been nice). Thank you for the quick call-back so I knew that I was doing it right! I dragged my husband all over town looking at one cage after another after another (and this was after spending hours of looking at pictures on the internet)...Nothing came close to how sturdy and pretty this cage is. My husband came home and was very pleasantly surprised to see how much better this cage is than any we saw in the stores or online. :) And it's huge! When I need anything in the future, I will save myself the time and trouble of shopping around and come straight to you! I know better now. :) Have a wonderful weekend!! Hi, just received the cage, pouches, and Wodent Wheel that I ordered a couple of days ago. I am thrilled with it all (so are the suggies). Your products, prices, and services are GREAT!!! I'll be ordering more items very soon. I really love your web site. I have been the proud owner of my suggie for 1 month now, and since the day I found your site I have found everything I needed to know. I just wanted to tell you that what you do is wonderful! Keep up the good work!!!! Thank you for your support when I called about some bent edges on the cage I received. I really felt better knowing if I could not make it work, the parts would be replaced. I very carefully straightened the edges with channel locks on the various places that were bent and the cage went together very well! I have 10 very happy sugar gliders in one cage now! I have a very large wheel in there, ropes and toys and two sleeping houses. Anyway they seem very happy and the cage is so pretty that is is now the center piece of the room! Just wanted to say Thank-you so much for my new Wodent Wheel and the gift's that you sent. I'm sure my little Sammie will have lot's of fun with this. And to let you know I will be back to order other things, So until then THANK'S again and take care.